I want a flip-book of this strip in the xkcd store! Last edited by Primis on Mon Mar 25, 2013 11:26 am UTC, edited 2 times in total. Looks like it was just her hair sitting oddly. Edit: wait, no the one that just popped up for me earlier was one from a while ago. Weirdness. I notice we're up to http://imgs.xkcd.com/static/time03.min.js now. Maybe because it wasn't there when the strip first went up? 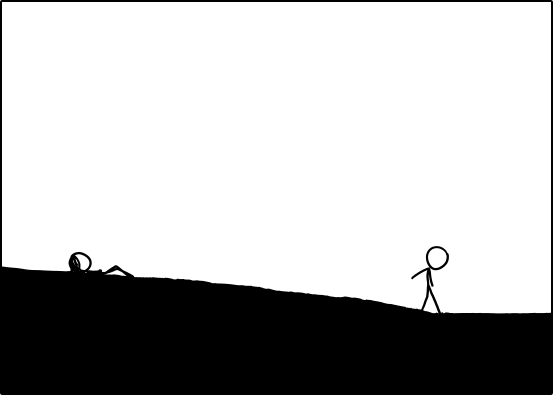 This is easily my second favorite XKCD, right after Click-and-Drag. Where is he going? What's going on? Oh god, the suspense! Will it be worth it in the end? We used to be waiting for a new comic every two days. Now we are waiting every 30 minutes. Thrill, as Guy looks into Water, for HALF AN HOUR AN ENTIRE HOUR! The excitement! Last edited by phlip on Mon Mar 25, 2013 11:02 am UTC, edited 1 time in total. Oh Randal! This is so great! @the hashes: has anyone tried "Correct Horse Battery Staple" as Salt or Key yet? I was just sitting, staring for the 0700 update... and I realized how horrible Randall could be if he made one of the pictures a screamer. Please, please don't do that, Randall. Please no. Edit: With the new one, the guy's stopped? No longer walking away? Subtle change this time. Last edited by Waladil on Mon Mar 25, 2013 11:05 am UTC, edited 1 time in total. Oh, for those who haven't noticed yet: that's the ocean on the right. Or at least some kind of water. If you flip through all the different panels, you can see that the ground area where the characters are doesn't change, but the area on the right does wave up and down a little. Which I think means they're on a beach, and that part on the right is the water. Guy is staring into the water. eventually, and sooner rather than later, she won't be able to come with him anymore. I guess if you have to visualize death this is a halfway uplifting approach. Something jumps out of the water. The base URL http://imgs.xkcd.com/comics/time/ throws a 404 in my browsers. Further research may be required. ...It took me like five minutes to get here because I couldn't remember the forum URL, it wasn't in my browser history, and uni.xkcd.com wouldn't let me do anything while the nonloading comic was loading. In the last 10 minutes, the guy has bent over. I don't think it's by the half hour. He stands up and bends down whenever I refresh the page. My guess: this was supposed to be a slow playing movie, with a random time between reloads. The time0x.min.js's we're seeing mean Randall's debugging while we watch. He's dipped his foot in the water!! The way I saw it, I think he's dipping his toes in the water. The arm backward is for balance. Randall has turned drawing stick figures into art. I was just about to write that he was dipping his foot. But then it turned out I had no registration here. Anyway I think this is going to be a LOOONG one, but I hope it's not something too sad. I mean it is obviously some sort of life change analogy...maybe it's something happy? I'm not sure how to post the link without being flagged as sapm, but the name was "time06.js" if you view source you can find the link. I'm in ... Mountain Time zone, where it's 4:45 am, and he's still leaning forward, not straightened up, or with his arm out yet. cephalopod9 wrote: I'm in ... Mountain Time zone, where it's 4:45 am, and he's still leaning forward, not straightened up, or with his arm out yet. maybe this'll end up being a joke and not a meditation on death after all. sincerely hope so.